Händel was born in Halle, Saxony-Anhalt in 1685 the same year as both Johann Sebastian Bach and Domenico Scarlatti. He displayed considerable musical talent at an early age; by the age of seven he was a skilful performer on the harpsichord and organ. For a while he studied law, following the wishes of his father, but on his fathers death he abandoned the law for a musical career. At the age of eighteen he took up the post of violinist and harpsichordist in the orchestra of the opera house in Hamburg. Over the next few years he was to travel extensively in Italy, spending time in Rome, Naples and Venice where he learned the Italian "Opera Seria" style, and where his early operas were written and performed. In 1710 he was appointed Kapellmeister to the Elector of Hanover, later King George the first of England. This appointment allowed him sabbatical leave which he used to travel to London. His first visit to London in 1710 included the first performance of his opera Rinaldo which was an enormous success. Musical theatre had been very popular in London, but since the death of Purcell in 1695 no really great composer had emerged to satisfy the public demand for it. 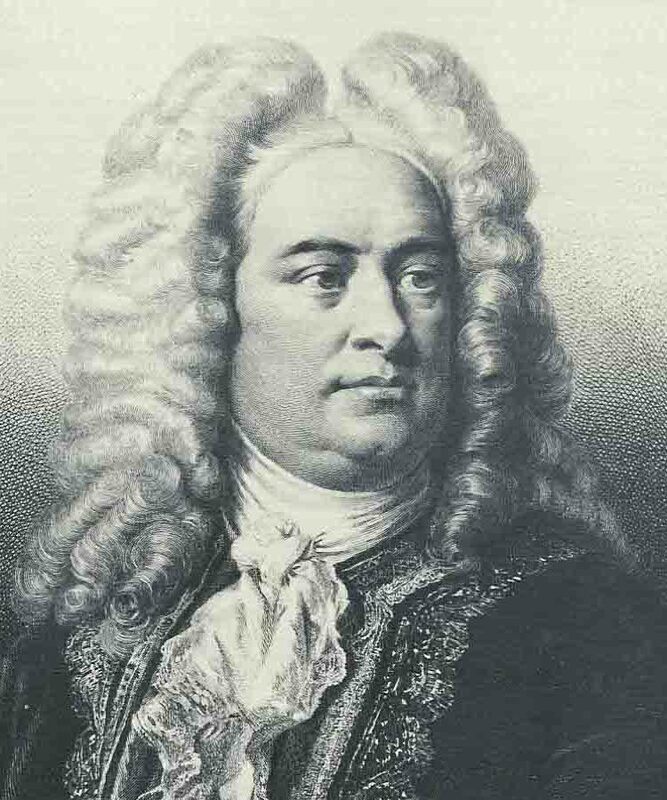 Händel, with his deep understanding of Italian opera and his exceptional ability to write for both the voice and the orchestra became immediately established as the successor to Purcell. Rinaldo is still regularly performed and is renowned for its range of writing. The aria "Lascia ch'io pianga" has a simple subdued accompaniment, and relies on the beauty of the vocal melodic line for its success. It expresses the deep sorrowful emotions of the heroine Almirena. In contrast "Or la Tromba", is a heroic aria, sung as Rinaldo prepares to lead the crusaders against the infidels at the siege of Jerusalem. It has a triumphal character using the full orchestra with brilliant virtuosic vocal and trumpet writing. de' miei martiri sol per pieta. Of my sufferings, for pity's sake. The birthday ode for Queen Anne was composed during Händel's second visit to London, and first performed on the Queen's birthday: 6th February 1713. The original manuscript has been preserved. The ode is in eight stanzas, and each was was written for a particular soloist who is personally named on the manuscript. The first stanza, which we are performing, was written for a celebrated high tenor of the Chapel Royal named Eilfurt. It is scored for strings oboes trumpets and continuo. The words on the surface are full of flattering praise for Queen Anne, but may also contain underhand jokes at her expense. She was not popular among the contemporary London writers and artists, and was generally regarded as a ineffectual leader given more to eating than intellectual pursuits. A popular doggerel poem during the reign of her parents, William and Mary, pokes fun at the habits of the royal family: "Queen Mary talks all, King William thinks all, Princess Anne eats all and Prince George drinks all". In the chorus she is described as "great Anna", which may have been a sly reference to her size, rather than her achievements. At her funeral in August of the following year her coffin lid was nearly square in shape. Eternal source of light divine! Who fixed a lasting peace on earth. Shortly after the death of Queen Anne, Händel moved to London as the court composer, and remained there for the rest of his life producing a succession of operatic masterpieces for the London stage that are now widely regarded as the greatest of the baroque period. His other major works include oratorios, both sacred and secular, which by tradition were written in English, and spring more from the work of Purcell than the Italian composers. The most famous of these, the Messiah, was completed in 1741, and first performed in Dublin in 1742. The words were collected and arranged by Charles Jennens who famously wrote to a friend in 1745 "he (Händel) has made a fine entertainment of it, tho' not near so good as he might & ought to have done." Notwithstanding this disparaging comment, Messiah has remained Händel's best loved and most performed work. The aria "Thou art gone up on high" is scored for strings, and has a beautiful flowing vocal melody weaving in and out of a complex contrapuntal string texture. That the lord might dwell among them. Händel arias for counter tenor were performed on the 12th December 2009 by Robert Cross accompanied by the Portobello orchestra, conducted by Anthony Weeden.